What is this post mortem? Idlebrain.com is starting this exclusive, explosive and exciting section called Postmortem, where we conduct a postmortem of the latest releases. We shall be discussing and analyzing the strengths and weaknesses of the movies with their respective directors as to why those films have become hits/flops. We request the directors to give us their honest and frank opinions. I am brought up in ‘Maredpally’ and finished schooling in HPS and then joined a JNTU affiliated engineering college (SVIT). It's been four years since my college time is over and I have cleared off my backlogs in last month. I wrote my arrears after completing second schedule of Pelli Choopulu. I got my engineering degree along with my film release. Officially, I am an engineering graduate now. During engineering studies, I used to bunk college and make videos for money. I used to design posters for clubs like Touch. They used to pay around 2000/- to 3000/- per poster. I used to invest most of those earnings into short films. I have few friends who are passionate about films. We used to collaborate and make short films. Then I made it a company and registered it as Vinootna Geetha Media Pvt Limited (named after my mother). I hired a small barber shop in Somajiguda and renovated it to make it our studio. During my college time, I had no office space and used to work out of my bed room. After college, I got into wedding photography and worked with a renown photographer Joseph Radhik. I shot Vijay Mallya’s daughter wedding and Ram Charan’s wedding. Then I realised that I was running behind the wrong things. I took a step back and decided that I willn’t do wedding films. I started doing short films again with a bit of experimentation. One such short film was Anukokunda. That’s when I met my wife Latha online. She is a graphic designer. Anukokunda short film went viral and I started getting offers from the likes of Ram Mohan (producer of Uyyala Jampala and Ashta Chemma). I traveled with him for 2 years and then walked out. After that, I made a short film called Sainma. That was shot with sync sound. I wanted to monetize my short film by using the payment mode of mobile balance. As all teenager has access to mobile balance than to a credit card. I have launched a site with payment gateway and generated Rs. 40,000/- through Sainma short film. I didn’t seem like a sustainable business plan as I didn’t have deep pockets. Through Sainma, I have discovered a style of filmmaking. I made Sainma out of frustration I had after fallout with Ram Mohan. I was supposed to do a RomCom with him, but I walked out because it was not happening. I ended up making a RomCom as my debut. Ram Mohan calls me and tells jokingly that I had to make RomCom anyway for debut. How about two contrasting personalities meet for Pelli Choopulu. What happens if things go horribly wrong? That was the basic idea. I wanted to include food in the film. I wanted to name this film as ‘Anukokunda’, but somebody else had registered it. Hence we found Pelli Choopulu to be the apt title. I have learned in filmmaking course that characters need to have strengths and flaws. Heroine is the personification of the mind and hero is the personification of the heart. It’s a conflict between heart and mind we go through every day in our lives. Chitra can never emote and you can’t think what’s going through her mind. Prasanth is all heart. He feels something, he says it loud. I am also inspired by a few films. I followed character arcs from Knocked Up (directed by Judd Apatow). Knocked Up is conceived as a RomCom, but it’s a coming of age film involving two contrasting characters. I am also inspired by Chef for food truck business thread. Another food film ‘100 foot journey’ has also inspired me. Food is a good thing to add in a film and it makes your audience feel hungry. I wanted people to go and eat samosas during the intermission. What is life without good company and good food. That’s what Pelli Choopulu talks about. Hero and heroine getting stuck in a room during Pelli Choopulu is a metaphor for dating. Food truck in the film is a metaphor for live-in relationship. It’s a modern day relationship story and families are connecting to it because of emotions. Families have a lot of mental blocks about dating and live-in relationships. But’s it's there in Pelli Choopulu. It’s a modern relationship in traditional environment. There is a true emotion for modern day relationship and families are liking it in Pelli Choopulu. I write scenes in such a way that there is either plot progression or character development. I didn’t want any character to be antagonized in the film. I sincerely feel that no person is a bad person, only situations make them behave like that. All my characters are three dimensional. You might feel Richa is a snob. But she has her own issues. I made sure that each and every character has a proper closure. Nandu acted selfish at certain point of time. But, he came to say sorry at the end. People might think that hero character is irresponsible and heroine is responsible in the film. But it’s not true. Hero character is also a responsible one. But, he is lazy. His procrastinating attitude comes from the fear of failure. Every student is undergoing this at present. Guys have a lot of pressure in society to perform. Guys sitting on walls and smoking is a result of fear of failure. Prasanth is scared of responsibility because he is scared to fail in the eyes of his father and society. I wrote story in 45 days. I was working with Lakshmi Manchu at first. She loved the script. We worked on it together. She had a lot of personal commitments. She asked me to go and spread my wings first. I approached Vijay Devarakonda and then I met Raj Kandukuri. Things started falling in place once I met Raj Kandukuri. 15 minutes into narration and he said that he would do the film. He followed it up regular. We started pre-production after 15 days. I tried to apply what I learnt from the film school. I did a 40-days film diploma course of NYFA (New York Film Academy) in Mumbai. I have worked for over 20 short films during that period of 40 days. I have worked with the executive producer for Anurag Kashyap’s films. I have worked with the director of Blue. I understood that our film Maya Bazaar followed the same pattern of filmmaking that is being taught by NYFA now. I guess over a period of time we started becoming lazy while making films. We started using dialogues more predominantly in Telugu films. If you play a Telugu cinema on radio, you will understand it. That's the crutch in Telugu cinema. Maniratnam tells that dialogue should be last thing to employ while making a film. Storyboarding and shot listing should be the language of cinematography. I understood the visual film grammar. Sync sound was employed. Sync sound will also help bringing discipline on sets. Sync sound is a part of sound design for any film. It’s not a separate process itself. There is something called ADR (Additional Dialogue Recorder). After recording dialogue at the sets and then you ask everybody to be silent and then record the room tone. That is to understand the dynamics of sound in that room. You use that room tone and then employ the dubbing to make it sound natural. Otherwise, the sync sound will be similar to that of a TV serial. Filmmaking is about respecting two things - time and space. Spatial continuity and temporal continuity. When heroine and hero get up locked in the room, there will be sounds of kids playing gully cricket outside. It adds up to the character of location though we don’t specifically notice it. Music director Vivek Sagar is from Chikkadpally. He is a part of our band. He has also worked with AR Rahman in the past. He calls himself as musician, not as music director. He is a chilled out chap. Raj Kandukuri was skeptical about music as Vivek Sagar was not using many instruments. Vivek Sagar told us that silence is also music and let's experiment. Vivek used minimalism and instrumentation as per the requirement of scene. He scored songs and background music as per the requirement of script, but not to boast his portfolio. I have been traveling with the cinematographer Nagesh Banell for the past seven years. Latha has done art direction and costumes design. A lot of thought process has gone into while selecting locations and props. What’s the budget of the film? I don't know if I am supposed to reveal it. 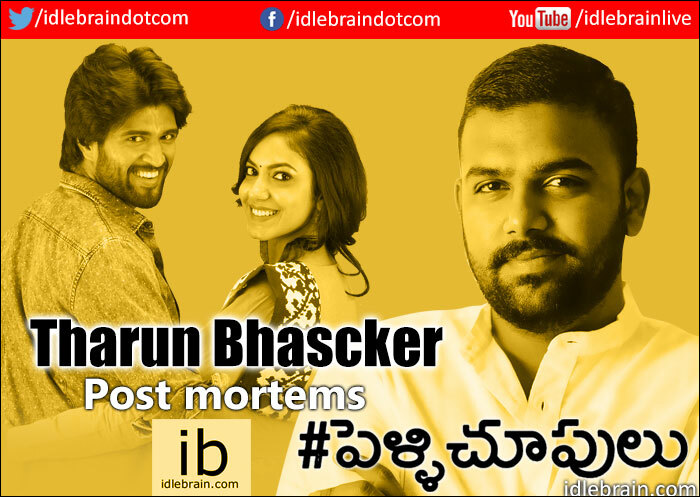 Pelli Choopulu was shot under the budget of Rs. 70 lakhs. This is excluding payments the actors and calculating interest rates on finances. If you include the above two components, the budget is coming up to Rs. 1.2 crores. It won’t be right to say that I wrote all the dialogues. We had workshops. I wanted the dialogues to be colloquial. I want them to understand the diction and be honest about it. A dialogue like ‘naa chaavu nenu chasta. Neekunduku’ has no effect if you tell the dialogue to anybody outside. But that dialogue is the best dialogue of the film because of the scene. It also represents the frustration of just graduated youth. That question irritates the unemployed youth. That’s the constant pressure youth face. I have a good bunch of friends who keep my life interesting. Most of the conversations written to Priyadarsi are from my personal experience with friends. I draw inspiration for these characters from my friends. ‘Thank you for making this film’ is the most general compliment I am getting. My friend’s friend Suma saw the film with parents. They used to pressurise her to get married. After watching the film, they have made a decision to let Suma pursue her higher studies. I also loved the way audiences are responding mass single screens like Sathyam and Santhi. Do you believe in numerology as you changed spelling of Bhaskar to Bhascker? My dad used to believe in Vastu and numerology. Initially, I resisted changing the spelling. But, later I started respecting his faith. He is drawing his hope from numerology. I respect it. Why do you think Pelli Choopulu has created such a positive buzz universally? While writing film, I told myself that I was doing a commercial film that will be liked by all families. Once I started making the film, people around us started commenting that there is no rhyme (punch) in dialogues and there are no separate songs etc. What worked for the film is a complete relatability. Movies are meant to offer escapism for audiences. I offered reality in a pleasant matter and people loved it. We cut out the sweet moments of life and put it in cinema. This film has become a huge success. Are you getting paid a handsome amount? I am promised a handsome amount. Much more than what I had achieved. I am still waiting. It's in the cloud. I think all our team members will make a modest living. No worries! I want to live a life first. I plan to portray life in cinema. I made a short film titled Sainma. I want to make the same subject as a feature film. I want to talk about rustic life of people in Telangana. I want to make an entertaining film with vivid characters. It will be like Malgudi Days. I leave the canvas open, but i don't want to go for big stars now.